In the greater scheme of things, it's Mother Base that will have the most impact on your success. The bigger and more powerful your Mother Base, the closer you'll be to achieving your ultimate goal. Mother Base is your home, and expanding it opens up more options in the field in the form of items, weapons, and support. In turn, clearing missions and recovering resources and personnel enables Diamond Dogs to grow. The Fulton is your friend. When on missions, make it a priority to recover personnel, weapons and resources. Snake's new Mother Base called Diamond Dogs is the home of his new military force, As you gather personnel and resources you can expand the base, which will in-turn allow Diamond Dogs to support you in the field. If you meet the proper requirements, you can issue orders to develop various types of weapons or items, get field support in the form of intel, supply drops, first aid and medical treatment. 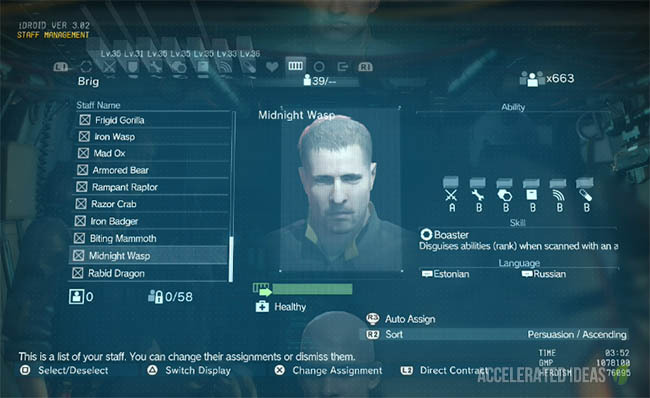 All of these support features are enabled and managed through the development of Mother Base. For those who want to manage every aspect of your army, you can handpick assignments for various units, but if you prefer, you may also leave it in the hands of Miller to make assignments as he sees fit. How deeply you are involved in the day-to-day management of the base will depend on your personal preference and playstyle. In addition to the management of Mother Base, there are also related activities and a few new surprises and secrets. To begin, we'll introduce the primary sectors that correspond to the various units on MB. Here's a quick look at each sector and their operation, and also details on how you can expand and level up each facility to strengthen your various units. You can freely walk around Mother Base, you start on the command platform - the center of your base, and the heart of Diamond Dogs. By expanding this platform you can enable more staff to join your army. But it's up to you, as the player, to actually recruit the right people into your army by locating and fultoning highly-skilled personnel from the field. Recruits can be culled from the ranks of enemy soldiers who you manage to capture, or they may be POWs or volunteers who are attracted to your army due to your reputation. New recruits are automatically sorted into units that best suit their particular abilities. However, players can opt to reassign staff as they see fit. 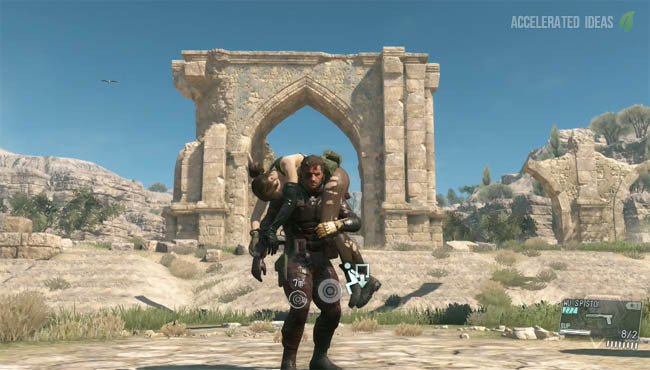 Since Mother Base in TPP is an actual physical location, you can also interact with the soldiers that you've fultoned once they join Diamond Dogs. As you gather more staff, things will get crowded at base, and at a certain point, you'll reach a limit. Once that happens, you'll then need to invest in expanding Mother Base to facilitate more staff. Aside from the command platform, which serves as the hub of your base, you can also build other specialized platforms for each of your units. You can choose which platforms to prioritize along with the location of your platforms and can customize other elements such as color. As such, every player's Mother Base will be unique. 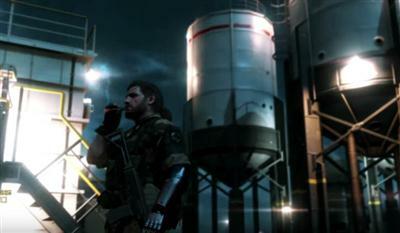 In this walkthrough, our R&D platform is connected to the Command Center by a bridge and is an example of the spoked design of Mother Base. This platform houses the R&D team who work around the clock to develop new weapons and items based on your orders. The proper weapons and items are invaluable as you proceed through game, so it's wise to invest properly in R&D. New projects will be added to the development list based on the level of your R&D team, and actions you perform during missions. Examples include various types of firearms, along with powerful weapons such as missiles,and other more specialized items as well. Invest in the equipment that best suits your mission and play style. It's here that he'll develop new types of robotic technology. Next up is the combat unit. The combat unit is comprised of autonomous fireteams capable of completing a variety of tasks. You can take advantage of them by deploying them on dispatch missions. If they succeed, they will reap various rewards, as outlined in the dispatch mission list. However, there is also a chance of failure, so be sure to select missions that match the teams skill level. Note that certain dispatch missions will also resonate with Snake's solo missions,making things a little easier for you while in the field. If you feel like it, you can also send members of the combat unit out on missions in place of Snake as the playable character. This can be to your advantage, as some staff members possess specialized skills that are useful in the field. For example, a soldier with the botanist skill will have an easier time identifying and gathering plants and herbs. It's good to keep this in mind if you're having a hard time fulfilling a specific mission objective. This section of Mother Base houses your support team. The support team, as their name implies, provides various forms of backup and support for Snake while you're out on the front lines. Support can come in many forms including the delivery supply drops containing weapons, ammo, and even vehicles. The support team can also provide back-up in the form of airstrikes, diversions, and cover fire. The better your support team is, the faster they'll be able to assemble and support you in the area of operations. However, flying choppers to the frontlines isn't free, so be sure keep an eye on your GMP (money) to keep from going into the red. Level up your support team enough, and they can even develop techniques to manipulate the weather. With capabilities such as this, you are able to turn the very environment against the enemy and use it to your advantage.